Sun Realty's Top 10 List! There are so many fun things to see and do on the Outer Banks of North Carolina. 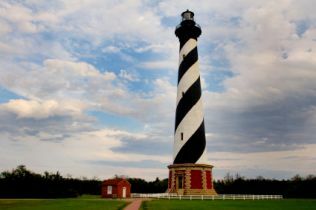 We've compiled this list of "Don't Miss" attractions to help you plan your Outer Banks vacation. We offer Outer Banks vacation rentals near all of these exciting destinations. #1 Cape Hatteras Lighthouse The most recognized symbol of the Outer Banks is certainly the black and white candy striped lighthouse in Buxton. The Cape Hatteras Lighthouse is the same height as a 12-story building and is the tallest lighthouse in the United States! For 2009, the lighthouse is open to visitors from April 17th - October 12th. You may climb to the top, but be forewarned - it's not an easy journey! Be prepared to climb up 248 iron steps with no air conditioning. However, the view from the top is so worth the effort! #3 Jockey's Ridge No trip to Nags Head is complete without climbing to the top of Jockey's Ridge! Located in Nags Head at Mile Post 12, it is the tallest natural sand dune system on the east coast. The fragile system of dunes constantly changes in response to the wind and weather. Visitors will find a 1.5 mile self-guided trail, a 360 foot boardwalk, and a 1 mile soundside nature trail. You'll see many families flying colorful kites, and kids having fun rolling down the dunes. 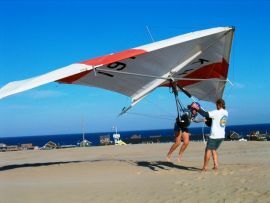 Hang gliding lessons are available for folks of all ages - even children as young as 4! #4 The Lost Colony at Waterside Theater First staged in 1937, The Lost Colony performance is an Outer Banks tradition. Over 4 million vacationers and locals have experienced this moving drama. Performances take place at 8:00 pm Monday-Saturday during the summer months. Enjoy a special offer exclusively for Sun Realty guests , use the promo code SUN2013 when reserving your tickets and receive $2 off any adult admission. Also, kids under the age of 12 receive free admission with any adult admission on Monday nights. #5 Whalehead Club This grand structure was built in the early 1920s as a private hunt club. The wealthy Whalehead Club in Corolla NCindustrialist owners lavishly entertained friends in the then remote area of Corolla. Over the years, the residence changed hands and fell into disrepair. In 1992, Currituck County bought the Whalehead Club and restored it to its original grandeur. Vacationers are invited for tours and special events. #6 Elizabethan Gardens Located on historic Roanoke Island, these breathtaking gardens offer flowers, shrubs, and trees. Marvel at ancient live oaks, smell the herb garden, and delight in the endless array of blooms. The Elizabethan Gardens are open 7 days a week, year-round. #7 Bodie Island Lighthouse & Coquina Beach Folklore contends that Bodie Island (pronounced "body") got its name from the numerous "bodies" that washed ashore due to shipwrecks. The current Bodie Island Lighthouse actually had two predecessors - the first succumbed to poor construction, and the second was destroyed during the Civil War. 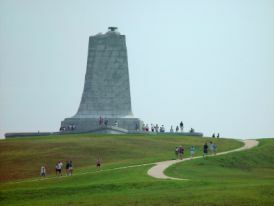 Across the road, Coquina Beach offers some of t Wright Brothers Memorial on the Outer Banks of North Carolinahe widest, most beautiful seashore on the Outer Banks. Parking, showers, and restrooms are available at this pristine public beach. #8 Wright Brothers Memorial You simply can't talk about Outer Banks history without mentioning Orville and Wilbur Wright's famous 1903 flight. Visit the exhibits, including a replica of the Wright's "flying machine." Be sure to climb Kill Devil Hill where the 60 foot pylon stands - you'll find stunning views of both the ocean and sound from the top. #9 Festival Park & the Elizabeth II Located across from the Manteo waterfront, the 25-acre Festival Park offers fun for the entire family. You'll find interpreters in period costume, an interactive museum, and a variety of cultural arts programs. Be sure to visit the Elizabeth II, a replica 16th century sailing ship. #10 Currituck Beach Lighthouse Built in 1875, the brick lighthouse and the Victorian-style Light Keeper's House is part of historic Currituck Heritage Park in Corolla. Climb the 214 steps to the top and admire the stunning views of Corolla and the Atlantic Ocean. The Currituck Beach Lighthouse and Museum Shop are open 9:00-5:00 daily from Easter to Thanksgiving.